Bordeaux is a lovely historic city to explore on foot, with many monuments, historic churches, and narrow pedestrian streets. Bordeaux, the capital of the Aquitaine région and center of a famous wine region, is a charming, historic city with a mild climate with a compact center that is easily visited on foot (map). You can see the principal sites in a day, but a longer visit will allow more time for visiting museums and shopping. Much of the city center has been declared a UNESCO World Heritage Site, with more than 350 classified monuments. 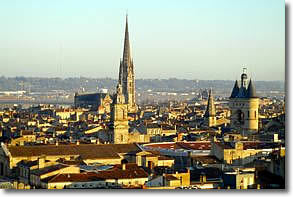 Bordeaux is also a great base for visiting nearby wine regions, including the Médoc and Saint-Émilion. The Esplanade des Quinconces, the largest public square in Europe, rspreads inland from the banks of the Garonne River to the Monument aux Girondins. It's lined with scores of trees arranged in quincunxes—four trees form a square with another tree in the middle, like the five on dice. The overall impression is of ranks of trees surrounding an open plain. 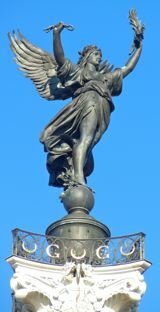 The Monument of the Girondins, commemorating the Girondists, deputies from the Gironde who died in the French Revolution, is notable for its beautiful fountain and bronze sculptures. Statues of Montesquieu (writer and wine maker) and Montaigne (mayor and philosopher) face each other across the open space. Walk from the Esplanade des Quinconces south along the Garonne River to the Miroir d'Eau, a large flat water pool with fountains that provides a cool spot in the summer and a true "water mirror" showing beautiful reflections of the neighboring Place de la Bourse (Stock Exchange Square), designed by France's royal architect with its gracious 18th-century buildings. Walk inland along Rue Fernand Philippart to reach the attractive Place du Parlement, with its beautiful buildings and choice of restaurants. Walk southeast along Rue Parlement Saint-Pierre to the Place Saint-Pierre, home of the church of the same name and more restaurants. 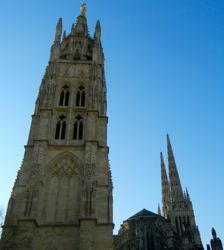 The Église Saint-Pierre is one of several Bordeaux monuments on the Route of Santiago de Compostela. Walk south along the Rue des Argentiers to the Place du Palais, a park just west of the Porte Cailhau (1495), the grand, elaborate city gate which once was part of the city ramparts. A few blocks west of the Place du Parlement and Place Saint-Pierre, the north-south Rue Sainte-Catherine is the longest pedestrian street in France, over 1 kilometer in length, the heart of Bordeaux's shopping area. Take a detour off Rue Sainte-Catherine east along Cours Victor Hugo to visit La Grande Cloche, the huge ornate portal from the medieval city walls, with its large bell and ornate clock. The northern end is near the Opéra National de Bordeaux - Grand Théâtre. This 18th-century theater has been beautifully restored, and guided tours are offered. The Cathédrale Saint-André, built between the 11th and the 15th centuries, is a large and graceful structure with beautiful stained glass. Its free-standing Pey-Berland Bell Tower, crowned by a golden statue of Notre-Dame d'Aquitaine, offers beautiful views of the city to those willing to climb the narrow, winding 231 steps to the terrace. Note that only 19 people can climb the tower at any one time, so you may have to wait in line to make the climb. Signs on the tower's panoramic terrace identify the monuments of the city. The Grosse Cloche, or large bell, is notably visible, as is the Basilique Saint-Michel. This Gothic Church, like Saint-André, has a separate belfry (open in the summer). It is also on the Route of Santiago de Compostela. Bordeaux has a number of excellent museums, including the Musée des Beaux Arts (Fine Arts), Muséum d'Histoire Naturel (closed for renovation until sometime in 2017), CAPC Musée d'Art Contemporain (Contemporary Art) and, of course, the Musée du Vin et du Negoce de Bordeaux (Museum of Wine & the Wine Trade). Just up the street from the Grand Théâtre is the Maison du Vin de Bordeaux, with its wine bar where you can sample and buy wines of the region. The École du Vin de Bordeaux also offers some education courses. Bordeaux's La Cité du Vin, inaugurated in June 2016, is an ultra-modern wine "theme park," a Disneyland of high-tech exhibits having to do with wine located in an architecturally striking building on the left bank of the Garonne 3.3 km (2 miles) north of Bordeaux's Place de la Bourse (map)(Tram line B to Bassins à Flot). Admission is by reservation at a specific time, so it's best to go online and make a reservation in advance. The price of admission includes use of a high-tech headset for your self-guided tour, a visit to the 8th-floor panoramic terrace from which you enjoy a 360° view of Bordeaux and the Garonne River, and a (small) glass of wine from a worldwide selection offered by the wine bar on the 8th floor. Videos of the world's wine-growing regions and of historical skits are projected onto huge wall-sized screens. Your electronic headset provides commentary in your preferred language—after you've learned how to operate it. Each exhibit operates a bit differently from the others, and we found ourselves continually puzzling over how to operate the next one. At the end of our visit, we were impressed with the technology, but also baffled by the constant succession of learning curves, and we had garnered only a few snippets of general information about wine. We felt our time would have been better spent visiting actual vineyards in the Médoc, or tasting wines, or even reading a book about wine. Above, View of Basilique Saint-Michel and the Grosse Cloche, Bordeaux. 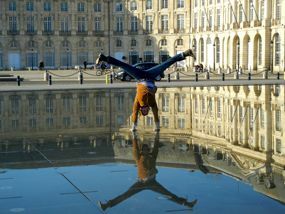 Fun at the Miroir d'Eau, Bordeaux. 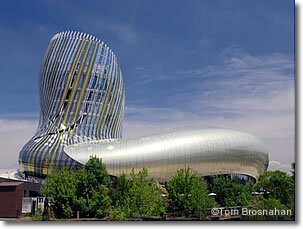 La Cité du Vin: striking architecture!